On Thursday night, they came. Thousands of them. 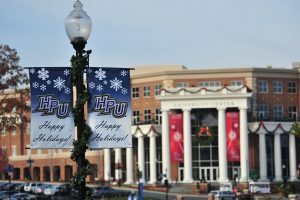 They came from almost everywhere to see how HPU transforms its campus every December into a scene that feels pulled straight from a storybook. They find that elusive sense of Christmas magic. They also find good will. 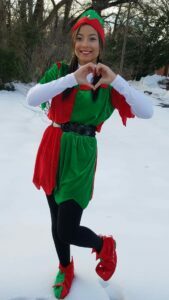 But moreover, they find an event that in its eighth year brings people together of all ages from every walk of life to discover their inner child and create a memory they can hold close forever. That is Community Christmas. It will continue this afternoon, starting at 5:30. 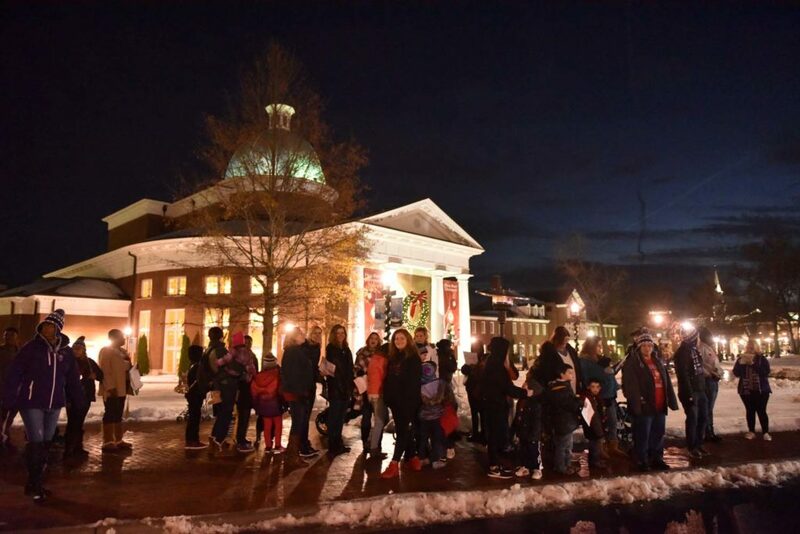 Five days after a foot of snow blanketed the campus in the area’s biggest snowfall in nearly a century, Community Christmas drew 12,000 people Thursday night. 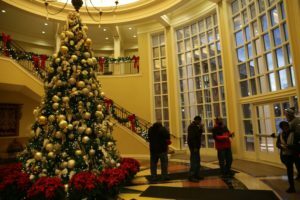 They came by the bus loads from nearby Oak Hollow Mall and entered a campus with 93,000 lights, 12,400 feet of garland, 300 poinsettias, 23 life-size Nativity figures, 12 Christmas trees and 130 nutcrackers and soldiers. Israel turned around – only for a second. Then, he was off, running into the building in his cartoon beaver hat to gawk at the huge Christmas tree inside. Bell, pastor of Without A Doubt Faith Ministries in High Point, has brought his family to Community Christmas for four straight years. “They (HPU) care about the community,” says Bell, 41, a married father of three. “They’re saying, ‘We’re not just here for the college, we’re here for the community,’ and they’re doing something we all can share. Everyone coming together. 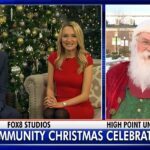 Dr. Akir Khan, an academic coordinator with HPU’s academic services, has volunteered for Community Christmas for at least the past four years. 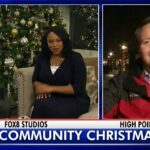 Dr. Khan is Muslim-American, chair of the Piedmont Interfaith Council, and he has seen firsthand how Community Christmas draws people from all faiths and from almost every corner of the world. 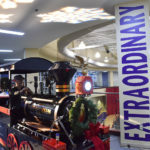 He saw it on the Gene and Jane Kester International Promenade a year or so ago when he volunteered as a greeter and walked up to two women, who looked awe-struck by the sparkle and lights surrounding them. They were mother and daughter, both recently relocated from Iraq. “We’re new refugees,” the daughter told Khan. “No, you’re new Americans,” he told them. That one conversation has stuck with him. 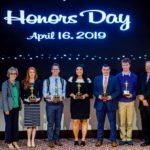 It shows him the core message found in every faith – the importance of building community – and the need for higher education, to help everyone of any means find a path to a brighter future. Laura Ana, 33, a restaurant manager from Staley, came to Community Christmas for that very reason. She wanted to introduce her 10-year-old daughter, Evangelia, to a college campus. She had never been to one before. Evangelia’s first stop: the campus statue of Abraham Lincoln. She coaxed her mom to take a photo of her beside Lincoln. Why? Jayleen Harmon climbed inside the Mobile Community Bus outside Congdon Hall, looked through a microscope and discovered how the stomata in leaves help a plant breathe. Jayleen, a sixth-grader from Winston-Salem, loved it. He loves science. His brother, Khalil, a fifth-grader, not so much. And yet, when Khalil went to one science station to understand how chemicals react, he changed his tune. He shook a tube and heard from the volunteers that the chemical reaction turned red for naughty, green for nice. His chemical reaction turned green. Then, Khalil and his brother disappeared into the crowd of people heading down the promenade toward the Slane Student Center to see Santa. And there, at Slane’s sliding glass doors underneath cascade of soap-bubble snowflakes, stood Thomas Patterson. Then, there were the three small children. They were Montagnards, an ethnic group from Vietnam, thousands of whom have resettled in North Carolina. The children came with their family. When they saw Patterson, they didn’t say a word. They ran, with their arms up, and hugged him around his knees. HPU senior Tyrah Henderson understands that. 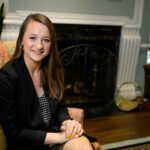 She’s from High Point, majoring in criminal justice, looking forward to joining the U.S. Air Force after graduation. 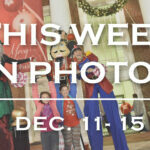 Like Patterson, Henderson became an elf Thursday and met loads of young children. She met them on the bus to and from Oak Hollow Mall. At the end of the night, she sat with one. He was no more than 3. He put his hand on her arm to get her attention. 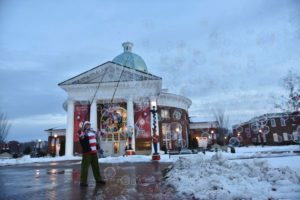 And with the bell in her red-and-green felt hat jingling as she leaned in to listen, she thought of her own Christmas memories growing up in High Point. On Thursday night, she made a few more.